Conservatives’ silver bullet is a joke. Poverty. Income inequality. Wouldn’t it be great if there was one silver bullet for both? Conservatives think they’ve found it in marriage. A recent American Enterprise Institute paper from W. Bradford Wilcox and Robert I. Lerman argues that declining marriage rates have increased poverty and income inequality. Senator Marco Rubio has called marriage “the greatest tool” we have to lift people out of poverty, and others have agreed with him, from Representative Paul Ryan to former Florida governor Jeb Bush. And they’re right that, in America, marriage is correlated with greater income. Single parents suffer a poverty rate five times higher than married parents. Median income for a single mother is about $25,000, compared with $81,000 for two parents. The inequality trickles down to the children: if kids have married mothers, they will grow up to be fourteen percentiles higher in income than those with single mothers. But beware assuming causation from correlation. Solving poverty by pushing more single people into the bonds of wedlock doesn’t pan out. What happens to single mothers who follow conservatives’ advice and get married? A nationally representative study found that two-thirds of these mothers will end up divorced. That’s worse for their finances than having stayed single in the first place. And sociologist Kristi Williams found no psychological or physical advantages for most teens whose single mothers ended up getting married. Married parents may be better off because they were already earning more. Recent research from the Brookings Institution found that the fourteen-percentile difference in incomes between the children of single mothers and married mothers shrinks by five percentiles when you take into account whether those mothers started out rich or poor. 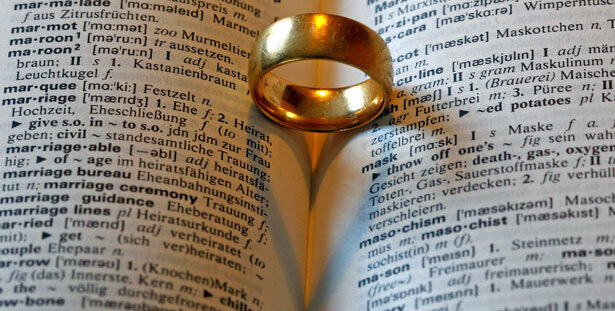 The marriage solution also assumes that the government can coerce single people to marry. This has worked poorly in practice. Since 2001, the US government has spent about $800 million on the Healthy Marriage Initiative, even as the national marriage rate continued to decline. In 2002, it spent $11,000 per couple in the Building Strong Families Project, which proved to have no effect on whether couples got married or even stayed together. And in 2003, it spent $9,100 per couple in the unsuccessful Supporting Healthy Marriage program. The government could embrace a proven approach to fighting poverty among single mothers. Consider the Nordic countries of Finland, Norway and Sweden, where single moms have far lower poverty rates than those in the United States. 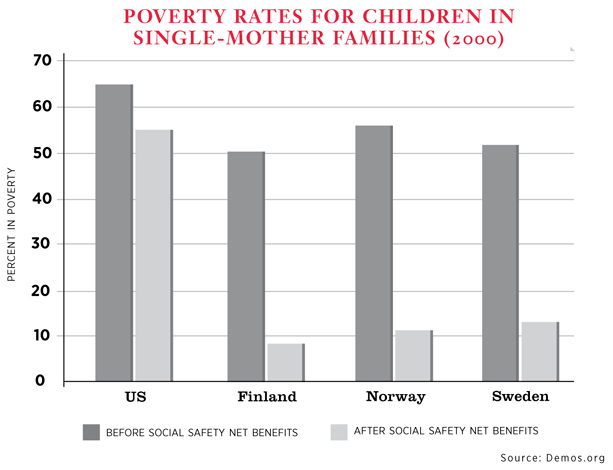 The key difference, as shown in the chart, is that these countries use social safety nets to lift single mothers out of poverty. The US safety net, in comparison, is thin and full of holes. What about income inequality? While increasing inequality is correlated with decreasing marriage rates here at home, lower marriage rates are actually associated with lower inequality in all other rich countries. Marriage rates, in other words, do not determine income inequality. Meanwhile, inequality is growing between most Americans and the very highest of earners, with the 0.01 percent pulling steadily away from everyone else. Married couples are not immune: those in the top 10 percent of income earners have seen their earnings increase by 39 percent since 1979—but for those in the bottom 10 percent, they’ve fallen by 12 percent. Poor single parents who get married won’t shoot to the top of the income distribution—they’ll be stuck at the bottom, too. half-full: In the midterm elections, sixteen cities and three states passed paid-sick-day laws, and four states passed an increase to their minimum wage—raising the number of states that have done so this year to fourteen. half-empty: Election night also ended with Republicans getting ready to assume control in a record number of states (twenty-four)—and that spells bad news for the policies that would help single mothers most. Welfare reaches less than a third of poor families with children, and the benefits are worth less now than in 1996. The United States is one of just three countries in the world that do not guarantee paid maternity leave: only 12 percent of American workers in the private sector have access to it. The United States should also guarantee paid sick days, like all other rich countries. Childcare for most families costs more than rent or food. In thirty-one states, it costs more than tuition to a public college.